Mitt Romney’s campaign is attempting to link Barack Obama to the corruption of Chicago-style politics of a different era. Romney is accusing Obama of practicing “Chicago-style politics.” Apparently, he has no idea what that means. If I hear one more person accuse the Obama campaign of practicing “Chicago-style politics,” I’m gonna kick all his nephews off the park-district payroll. I’m gonna send some precinct captains over to straighten him out. Mitt Romney and his surrogates don’t understand what Chicago-style politics means. No one seems to have told them that it’s been gone for 25 years. And they don’t get that Barack Obama, in his Chicago days, never had anything to do with it. Chicago-style politics, in common parlance, refers to the 1950s-1970s era of the Richard J. Daley machine. If you want to read a great, short book about that world, I recommend Boss by Mike Royko. The strength and durability of the Daley machine was its ethnically based patronage network, a complex system of obligations, benefits, and loyalties that didn’t depend on televised communication with a broader public. It was a noncompetitive system that in its heyday had a lock on urban power and the spoils that went with it. One of the most memorable phrases from that era comes from a story often told by former White House Counsel Abner J. Mikva, who described attempting to volunteer on a local campaign in the late 1940s. “Who sent you?” asked the cigar-chomping 8th Ward precinct captain. “Nobody sent me,” replied Mikva. The machine was dominated by the Irish and centered in Bridgeport, the rough-and-tumble neighborhood that was the ancestral home of the Daleys. Bridgeport’s antithesis has always been the liberal, multicultural enclave of Hyde Park, the University of Chicago neighborhood where the Obamas—and Bill Ayers—live. (The other thing the precinct captain told Mikva was, “We don’t want nobody from the University of Chicago in this organization.”) Hyde Park’s 5th Ward was the only one out of 50 to elect an independent alderman until the late 1960s, when political reformers like my parents and their friends on the North Side began to challenge the Daley machine. By the mid-1980s, the independents had mostly finished off the Daley machine—thanks mainly to the Shakman decree, still very much in force, which prevents any political consideration in hiring, firing, and promotion, with the exception of a thin layer of policy positions. This meant that when Harold Washington, a black machine politician turned reformer, was elected in 1983, he controlled only a few hundred city and county jobs, instead of the 35,000 Daley had at his disposal. By the time the younger Richard M. Daley was elected mayor in 1989, the Chicago machine was, like the Italian Mafia, more legend than force. Chicago-style pizza still exists. Chicago-style politics, equally deplorable in my view, no longer does. In 2008, John McCain ran ads describing Obama as “born of the corrupt Chicago political machine.” But Obama, who moved to Chicago in 1985 to be a community organizer in a politically disenfranchised neighborhood on the South Side, had no link to the Chicago machine at all. In Dreams From My Father, he describes trying unsuccessfully to get the attention of city officials—in the Harold Washington era—to deal with asbestos in public housing projects. That’s how far outside of Chicago-style politics Obama was. Obama never ran for a Chicago office. Hyde Park elected him to represent it in the Illinois State Senate in 1996. He tried for Congress in 2000 and lost. Then he got elected to the U.S. Senate in 2004. He somehow passed through Chicago politics without ever developing any real connection to it. 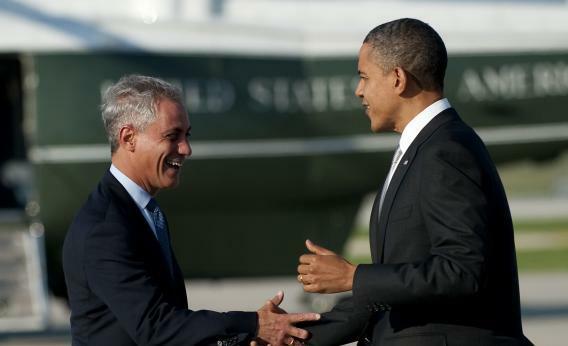 As for Obama’s Chicago-based hit men, well, they don’t come out of Chicago-style politics either. David Axelrod was a quintessential Hyde Park independent, a University of Chicago student and disciple of the reform guru Don Rose. Axelrod cut his teeth denouncing what was left of Chicago-style politics as a Chicago Tribune political reporter in the early 1980s before quitting journalism to help elect the notoriously honorable downstate politician Paul Simon to the Senate in 1984. That was the first campaign Chicago Mayor Rahm Emanuel worked on as well. Rahm was too young to have much to do with the Daley machine. As for the others, David Plouffe is from Delaware. Jim Messina is from Montana. They are in Chicago, but not of it. Some Republicans seem to think Chicago politics is about brutal, slashing attacks on opponents—Al Capone with an ad budget. That’s what John Boehner was complaining about when he used the phrase in 2009 to describe the way the Obama administration was demonizing opponents of his health care bill, like the U.S. Chamber of Commerce. But political aggression is hardly a distinctive Chicago trait. While American politics has never wanted for harsh negativity, the Chicago machine era predates media campaigns driven by sound bites and attack ads. The best modern exemplar of hardball politics is probably the late South Carolina political consultant Lee Atwater, who ran George H.W. Bush’s ugly 1988 presidential campaign. If they aren’t referring to machine politics, maybe Mitt’s boys are trying to say something else? In a recent call with reporters, Romney adviser Ed Gillespie described Chicago politics as simple cronyism, with contracts and rewards going to Obama’s largest fundraisers. But Chicago-style politics was never much about big donors either. The machine was funded through involuntary contributions. City workers had to kick back a portion of their salaries to fund the political operation. For an example of a politician notorious for rewarding major campaign contributors, look to Richard Nixon, the first president to put a price on ambassadorships ($250,000), and his relationship with the likes of Walter Annenberg. Of course, Romney isn’t interested in this kind of nuance. “Chicago-style politics” is mainly just a way for him to call Obama corrupt without coming out and saying so. Speaking for the campaign, former White House Chief of Staff John Sununu told Fox News, “This is a president who wallowed in Chicago—in the murky soup of politics slash felons.” Sununu, of course, swims in the clear broth of integrity slash ethics. But here too, the Romney line seems a little out of date. While Chicago aldermen have kept up their love affair with petty crime, Illinois state politics has become much sleazier, with half of the last eight governors moving from the state house to the big house. For a politician like Rod Blagojevich, it’s Springfield—away from the scrutiny of the Chicago media—that affords the real opportunity for corruption. Somehow, “Illinois-style politics” doesn’t have quite the same ring.